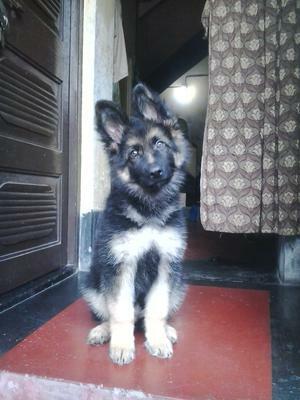 He is a pure bred German Shepherd. I got him from a kennel. Right now, he weighs 13.5 kgs and is 4.5 ft long. When I got him, he weighed 5 kgs and was 1.5 ft long. Dzango eats Royal Canin. His appetite is normal and he enjoys running and jumping. He is a very intelligent and energetic dog.